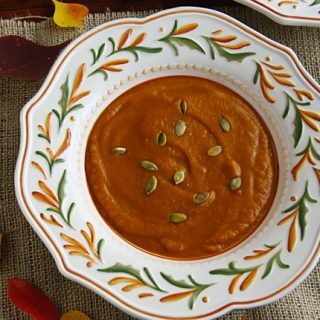 Sultry, spicy, and a little sweet, this creamy, vegan pumpkin soup is flavored with warming Ethiopian spices. Naturally gluten-free. I can’t pass up a pumpkin. As soon as I see winter squash laid out in rows at our local produce stand, I have to stop and buy many more than we’ll actually eat. My daughter will insist that we pick up a pie pumpkin or two, while I’m drawn to the less traditional ones: the crookneck cushaws (which actually taste better in pies than the pie pumpkins), the blue hubbards, the pretty sweet dumplings, the hard-to-find kabocha. If a pumpkin is truly fresh, it will keep through most of the winter in a cool place, but every year it seems I don’t use at least one in time and it goes from being a pretty table decoration to expensive compost. The thing that makes winter squash so attractive, their colorful skin, is the same thing that makes them seem intimidating and time-consuming to cook. That colorful rind is hard to peel and tough to cut through. There’s an easy solution, to the peeling part at least. I bake it. I still need to get out my biggest, sharpest knife to cut it in half, but once I’ve muscled through that job and scraped out all the seeds and goop, I plop it into the oven and cook it until the orange flesh practically falls off that pesky skin. Then I add it to dishes where it doesn’t need to be too solid, or I blend it until it’s smooth and creamy, as in this soup, which isn’t quite ridiculously easy but is fairly simple. Once the baked pumpkin was cool enough to handle, I scraped it off the rind and straight into my Vitamix, added the other ingredients, and blended it until smooth. (I was able to get the entire batch blended in my Vitamix with no problem, but if you’re working with another blender, you may need to blend it in batches.) Most bisque recipes call for the soup to be strained, but I like keeping all of the fiber, and the Vitamix makes it just as smooth as a fancy French strainer would. I was in the mood for berbere, the aromatic Ethiopian spice mixture, so I used some I had leftover from making Ethiopian-Inspired Red Lentil Soup. I’ve included the berbere recipe in the notes, but the truth is, you can season this basic soup with garam masala, curry powder, or just about any seasoning that catches your fancy. But if you like flavors that are sultry, spicy, and a little sweet, you really ought to give this Ethiopian-inspired version a try. 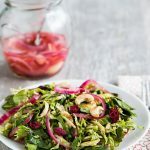 This is a very versatile recipe. You can use any type of winter squash instead of pumpkin and any type of seasoning instead of berbere, so this could be Curry-Spiced Butternut Soup or Baharat-Spiced Cushaw Soup. Just be sure you use around 3 cups of cooked squash and add seasonings carefully because they vary in potency. Preheat oven to 350. Cut the pumpkin or squash in half and scrape out all seeds and strings. Place it cut-side up on a baking sheet and cover with foil (or place in a large, covered baking dish). Bake for 30-40 minutes, or until flesh is very tender when pricked with a fork. Remove and allow to cool until it can be handled comfortably. Cook the onion in a large, non-stick pot over medium-high heat until it begins to brown. (If it starts to stick, add a tablespoon of water and stir well.) Add the garlic and cook for another minute. Add a splash of the vegetable broth to deglaze the pan, and then pour the onions into the blender. Scrape the pumpkin out of its shell and add the flesh to the blender, along with the remaining broth, tomato paste, and berbere spice mix. Blend until smooth. Pour the contents of the blender back into the pan, cover, and bring to a low boil. Reduce heat to low and cook, stirring occasionally, for 15 minutes. Add the non-dairy milk, using as much as needed to reach the right consistency. Add the lime juice, salt, and pepper, and simmer for about 5 more minutes before serving. Serve in shallow bowls, sprinkled with pumpkin seeds, if desired. Important: This recipe makes much more than you will actually need to make the soup. Store the excess in a tightly covered container. Delicious flavours! This looks like the perfect fall/winter meal. This looks yummy. You can also bake a pumpkin or any other kind of squash without cutting it in half first. Just poke 8-10 holes in it with a sharp knife then stick it in the oven. Cutting it open and removing the seeds is easy after it bakes and cools. thanks for sharing! Looks lovely!! Yum yum!! Will give a try!! 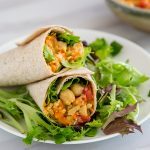 What a great dish – my husband spent some time in Ethiopia and we love to cook with berbere – bookmarking this one! This looks like a great “snack” while waiting for the big Thanksgiving feast! Since I don’t have a blender, I’d like to put the squash, broth & spices into the onion pot and use my immersion blender. Susan, do you think that would work? I would not use a no-stick pot so the blender wouldn’t mess up the coating,. That sounds like it would work. Enjoy! That looks delicious, Susan! And such a lovely blend of spices! 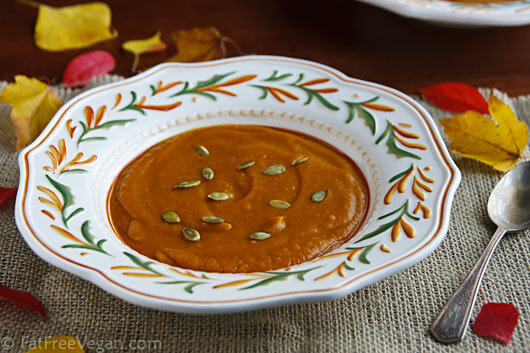 I love pumpkin, and I cannot wait to make this soup! what beautiful plates!! 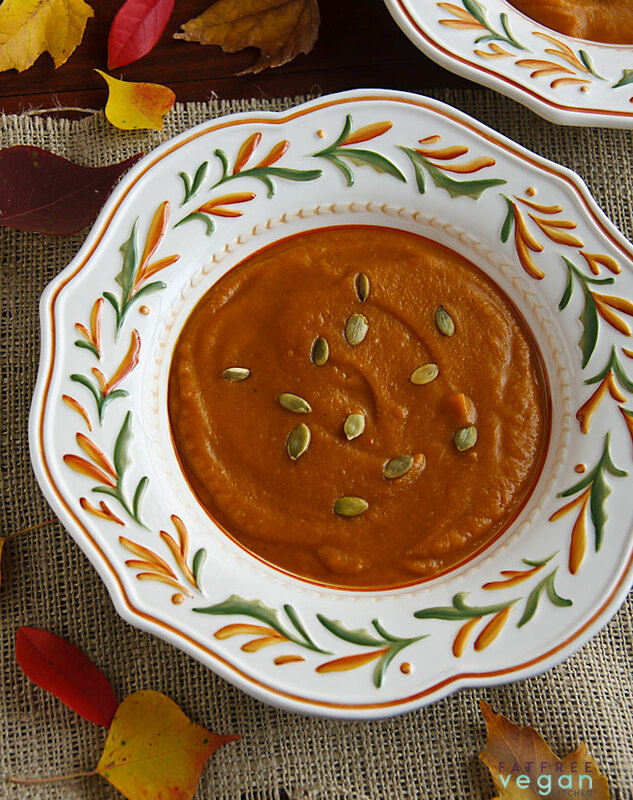 that’s part of my favorite thing with soup season… dressing it up in special fall dishes. If we’re in a hurry, will 3 cups of canned pumpkin or squash do? It’s better with roasted squash, but 2 cans of pumpkin should work. I keep coming back to look at this picture. It’s embarrassing! Thanks for the beauty and health hit today. I’m going crazy for butternut squash and used it in a soup recipe (with smokey paprika!) that I’m putting up on my blog tomorrow. But in a photo contest yours win hands down! My favorite time of year is pumpkin time! Making delicious pumpkin “flavored” recipes is a weakness of mine. I love trying new ones and this one sure does look good! Thanks for sharing and I hope to try it soon! Oooh! This was yummy with butternut squash. Left out the cayenne, and my daughter polished off a ton of it in two days! I used two tsp of nice fresh spice mixture, and it was quite strong. (Four tsp would have been overspiced, and I like strong spice.) Worked great in my food processor. Berbere is new to me and I love it. Thanks again for sharing your talent! This looks awesome! I’ll definitely have to make that spice mix soon, it sounds pretty amazing. This sounds very delicious 🙂 looking forward to buying my first cushraw soon!! Do you think it would be ok to make this without the cardamom and fenugreek? It will taste different, but it should still be good. I would add less cloves and cinnamon, though. 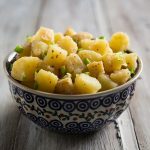 This sounds delicious, what a creative use of that wonderful spice mixture! And the photo is just gorgeous. I made this tonight except I did it half butternut squash, half pumpkin. I roasted a small butternut squash and used most of that but used canned pumpkin. I also substituted a fresh farmers market tomato for the paste. My spice blend was missing two ingredients that I did not have (allspice and fenugreek). All this said… it turned out GREAT! Thanks for another great recipe. That looks so tasty! I have an Ethiopian cookbook sitting on my shelf I should crack open….such yummy flavors. And I’m like you, any time I see squash, pumpkins or any other festive fall/winter item as such I buy too many!! I made this today out of a huge pumpkin that wasn’t all that good for cooking. After baking, the flesh was still stringy, and it wasn’t looking like it would make good pies, so I opted for the soup. It was as good as any pumpkin or squash soup I’ve bought at the store. I like the spice mixture. I had to improvise with what I had on hand. Substituted extra coriander for the cardamom, and a little cumin for the teaspoon of cloves, etc., in order to use what I had on hand. It was a very satisfying soup and not difficult to make. Cleaning the food processor was the hardest part! I will make it again. I can’t wait to make this. I don’t know how my kids will react to it, though. I think the berbere mix should give it a very interesting, almost sweet flavor. I change the garnish on this recipe, I added fresh thyme and made fresh almond butter, placed that in the center with roasted pumpkin seeds around and fresh thyme sprinkled around. I just made this and it is so good! It was my first time cooking pumpkin rather than using canned so I appreciated the directions. I used three teaspoons of the berbere and it was perfectly spicy! I too tried using my immersion blender but it didn’t seem to be powerful enough (perhaps my pumpkin was not cooked enough) so I put it in the food processor and it came out fine! Thanks! 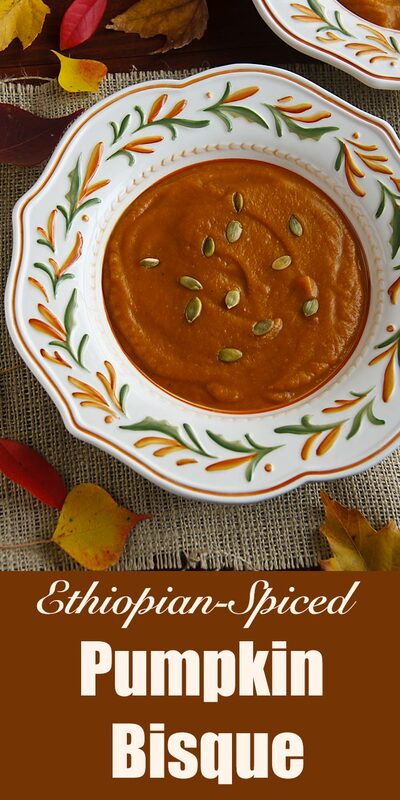 I’m sure this would be fabulous with fresh roasted pumpkin, but I made this last night to use some leftover canned (I used about 1.5 cans), and is quite delicious. I used about 3 tsp of the berbere blend, and probably wouldn’t have wanted much more; the spices were very strong tasting (and quite a kick with the cayenne which was great). Since I was using canned, I didn’t use my blender, so it was a tad chunkier than the photo because of the chopped onion, but still quite smooth. I am eating the leftovers now for lunch and I think it tastes even better than last night! I will add that since the spice mix is strong and a bit unusual, not everyone will like it. My husband ate his, but this was definitely not his favorite meal. I just finished eating a large mug of this soup. I have a nasty cold and the spices really warmed me up. I did add the larger amount of spice so had to counter it with more coconut milk.Next time I may not add the whole amount. Like in the lentil soup with this same spice mixture it probably would have been good to use sweet potato, perhaps half/half, to balance the spicy flavor. This soup is delicious and was easy to make, thank you! I used a quarter cup of soy milk and found that it was ruining the flavor, so I didn’t add any more. I think coconut milk would work much better or maybe it would be okay to use no milk at all. 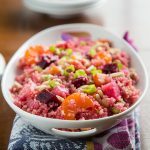 I prepared this using butternut squash and oh my goodness – another keeper!